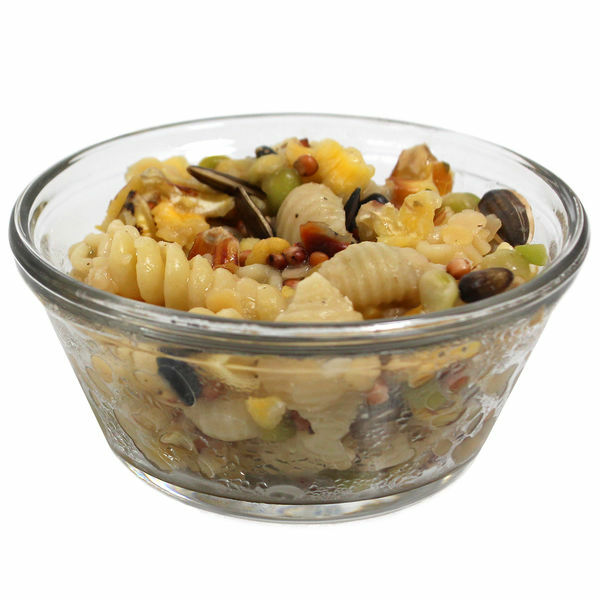 A nutritious, cookable snack for birds featuring a naturally colorful blend of veggies, seeds, and fun shaped pasta. Sunseed Crazy Good Cookin' adds fun and flavorful variety to your companion bird's diet. With three different kinds of pasta, carrots, red lentil seeds, and green peas, the naturally vibrant blend of ingredients and shapes in Pastamoré stimulates the senses through more than just its delicious taste. Just add water to cook, cool, and serve to your bird in addition to his regular pellet or seed-blend diet. Ideal for bird companions of all sizes. Crazy Good Cookin’ is meant to be fed in addition to a bird’s regular pellet or seed-blend diet.​​ Offer Pastamoré to your bird in a separate dish from their regular food. Remove any uneaten portion after about 4-5 hours. 1-2 oz per day for small to medium sized birds 3-4 oz per day for larger sized birds. Heat-Processed Whole Corn, Ground Wheat, Wheat Middlings, Red Lentil Seeds, Split Green Peas, Milo, Sunflower Seeds, Dehydrated Carrots, Dehydrated Celery, Fennel Seeds, Dehydrated Spinach, Spinach Powder, Tomato Powder, Niacin Supplement, Ferrous Sulfate, Thiamine Mononitrate, Riboflavin Supplement, Folic Acid.